FORT WORTH, Texas (Oct. 24, 2017) – The Davey O’Brien National Quarterback of the Week resides in the Big Ten Conference for the second straight week, as Penn State signal caller Trace McSorley has earned the distinction for week eight of the college football season. On Saturday, McSorley led Penn State to a 42-13 win over then-No. 19 Michigan by totaling 358 yards of offense and four touchdowns. Through the air, the junior was 17-for-26 for 282 yards and a touchdown. On the ground, McSorley rushed for 76 yards and three scores. He is the first Penn State quarterback with three rushing touchdowns in a game since at least 1982. McSorley extended his school record for consecutive games with a touchdown pass to 22, and picked up a rushing and passing touchdown in the same game for the 12th time in his career. Against the Wolverines, he became the fifth Nittany Lion player with 6,000 career yards of total offense, and now ranks fourth in school history (6,340). 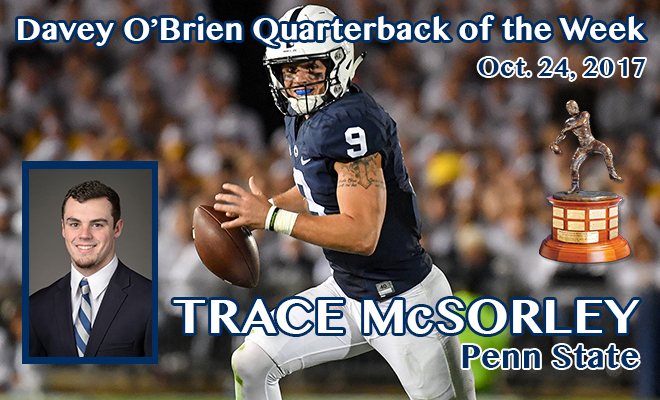 Prior to the season, McSorley was named to the Davey O’Brien National Quarterback Award’s watch list. For the year, he ranks tied for 11th nationally in points responsible for (126), 13th in completion percentage (.668), 17th in total offense per game (304.7) and 18th in passing efficiency (155.0). Last week, Ohio State’s J.T. Barrett was the recipient of the Quarterback of the Week award, and the two will meet on the field this Saturday in a matchup of top-10 teams. The other “Great 8” quarterbacks in week eight were: Anthony Brown of Boston College, Arkansas State’s Justice Hansen, Lamar Jackson of Louisville, Oklahoma’s Baker Mayfield, Malik Rosier of Miami, WKU’s Mike White and Logan Woodside of Toledo.